Pickathon Music Festival, now in its 15th year, has taken over Pendarvis Farm since 2004, and continues to attract devoted and diverse audiences. Every aspect of the festival seems fan-focused, with just six small stages, low crowd density, and many repeat performers (supporting the if-it-ain’t-broke-don’t-fix-it theory). It was a challenge not to be overcome by the beauty of the endless-mountain skyline, or overwhelmed by the number of quality acts; But on a cloudy, chilly day one, Paste checked out almost a dozen bands. Pure Bathing Culture, which includes members of the folk-rock band Vetiver, officially opened the festival on the Firm Meadows Stage with a soft, gauzy set, which was in stark contrast to Cedric Watson & Bijou Creole’s lively, multi-lingual, and melodic ruckus that followed on the neighboring Mt. View Stage. Singer Jessica Pratt, who played a number of intimate folk ballads with just one other multi-instrumentalist on the fest’s iconic Woods Stage (literally, as the name suggests, in the woods surrounding the Farm), provided the most respectful soundtrack to the natural enclave. Sallie Ford & The Sound Outside eased the main stage crowd into a set of ’50s-style rockabilly (emphasis on the rock), and the silly banter between namesake Sallie and guitarist Jeff Munger coaxed them to dance. 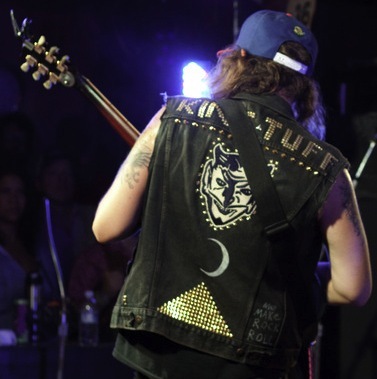 And later, King Tuff’s midnight sweat-fest in The Galaxy Barn elicited not just movement in the audience, but fist pumping and crowd-surfing. Day One’s highlight, however, was Andrew Bird performing almost an entire set with Tift Merritt on the breathtaking Woods Stage, with only two mics between four musicians. Plus, Bird led spirited covers by The Handsome Family and Townes Van Zant, in addition to his originals that left a packed and reverential audience begging for an encore.